Bicyclists on Commonwealth Avenue in 2012. Some bicycle and pedestrian safety advocates aren’t pleased with comments Mayor Martin J. Walsh made on Boston Public Radio Tuesday. During a live interview with the station, Walsh said pedestrians and bicyclists need to do their part to help reduce and avoid fatal and nonfatal crashes with cars in the city by more closely following the rules of the road. Walsh said that pedestrians, specifically, need to keep their heads up while walking down the street, take their headphones off, stay within the crosswalks, and obey traffic lights. Walsh said the same goes for cyclists, who are often criticized by drivers if they ride through red lights or stop signs. Even before he made those statements, Walsh seemed to know it would elicit some type of reaction, due to the sensitivity of the subject matter. “This is where I’m going to get myself in trouble right now on this show,” Walsh told the show’s hosts. 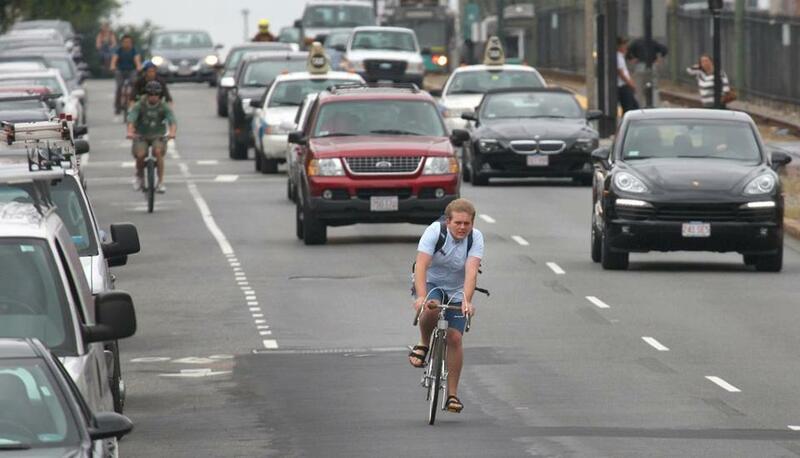 Earlier this month, a 29-year-old cyclist was killed in the Back Bay by a hit-and-run driver. Shortly after the interview, bicycle and pedestrian safety advocates called out Walsh for what they say were misguided and misinformed statements that placed the blame for crashes on those who are most vulnerable on the streets. “Boston’s clueless Mayor . . . blames bicyclists, Pedestrians for lethal crashes,” Steve Bercu, president of the Boston Cyclists Union, said on Twitter. In an e-mail to the Globe, Becca Wolfson, the group’s executive director, said they were “extremely disappointed to read and hear the interview” with Walsh, which was published on WGBH’s website shortly after it aired. Wolfson said the city has a responsibility to make the streets safer, and is instead blaming victims. Stacy Thompson, executive director of LivableStreets Alliance, which strives for better biking, walking, and public transit in the Boston area, said to the mayor’s credit, he cares about data and numbers. But, Thompson added, if Walsh were to took a look at data collected by his staff, “he would see that the vast majority of people injured while walking and biking are children or older adults,” and not necessarily people listening to their headphones and trying to dodge traffic. “It’s your grandmother, your child, your best friend — not a stereotype,” Thompson said. Thompson said Walsh’s comments conflict with the administration’s Vision Zero goal, which aims to eliminate serious traffic crashes in the city by 2030. “This is a step back,” Thompson said. StreetPAC Mass, which describes itself as an independent political action committee that works to elect officials who want to bring changes to the streets, also weighed in on the subject. “Drivers were responsible for all 22 fatalities on Boston streets in 2016,” the group claimed.